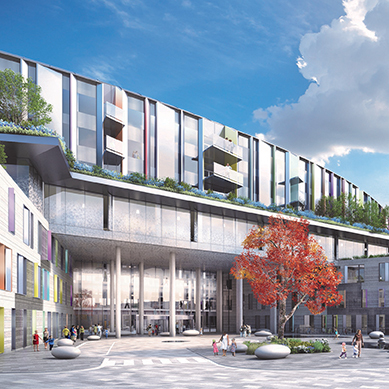 A decision is set to be made by February 15 on the application for planning permission, which was submitted earlier this month, for the new 473-bed National Children’s Hospital (NCH). The application is for the multimillion euro health infrastructure development comprising the National Paediatric Hospital, Innovation Centre and Family Accommodation Unit at St James’s Hospital, plus satellite centres at Tallaght and Connolly Hospitals, and a construction compound at Davitt Road, Dublin. Parties in the application for the private development, including an environmental impact statement, lodged on August 10, are listed as the applicant, the National Paediatric Hospital Development Board, and the three local authorities — Dublin City Council, South Dublin County Council (SDCC) and Fingal County Council. The last day for making a submission to An Bord Pleanála is October 2 and apart from the local authorities, some 14 prescribed bodies have also been notified of the planning application. They include the Minister for Health, the HSE and the newest prescribed body, Irish Water. The National Roads Authority, An Taisce, the Heritage Council, Inland Fisheries Ireland, CIE, the Railway Procurement Agency and the National Transport Authority have also been informed. Meanwhile, a planning appeal against a decision into an application by a leading network provider and communications company, Vodafone Ireland Ltd, to erect six telecommunications antennas and associated ancillary equipment on an existing rooftop, including ancillary site works at Tallaght Hospital, has been deemed invalid. The SDCC, having regard to the minimum allowed separation distance of telecommunications antennae from hospitals, determined on June 26 that the proposed development would materially contravene a provision in its current Development Plan contrary to the proper planning and sustainable development of the area. An Bord Pleanála decided the appeal, lodged on July 27, was invalid under Section 27(1) (g) of the Planning and Development Act, 2000, which provides that “an appeal or referral shall be made within the period specified for making the appeal or referral”. Antenna Designs for Wireless Medical Implants. Tallaght Drugs Task Force: service development plan.